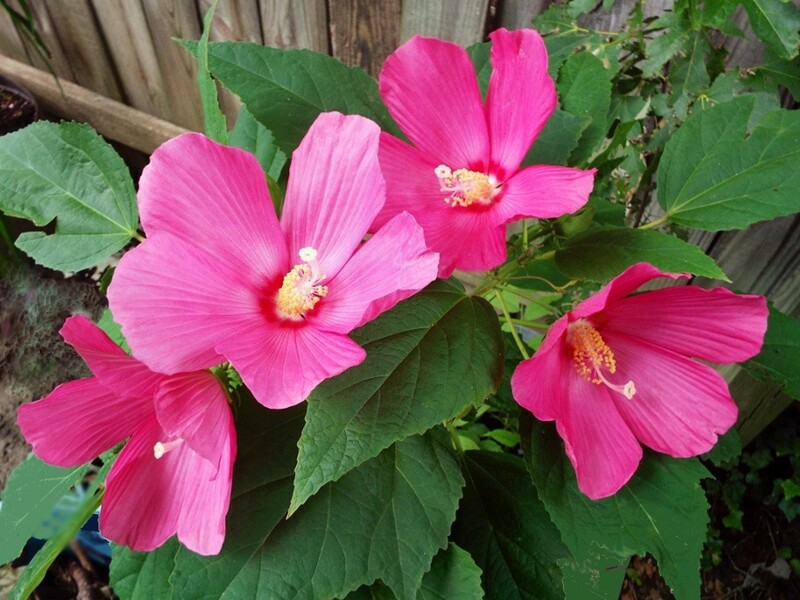 Add a touch of the tropics to your garden by planting hibiscus plants in varying colors. This is a guide about growing hibiscus plants. 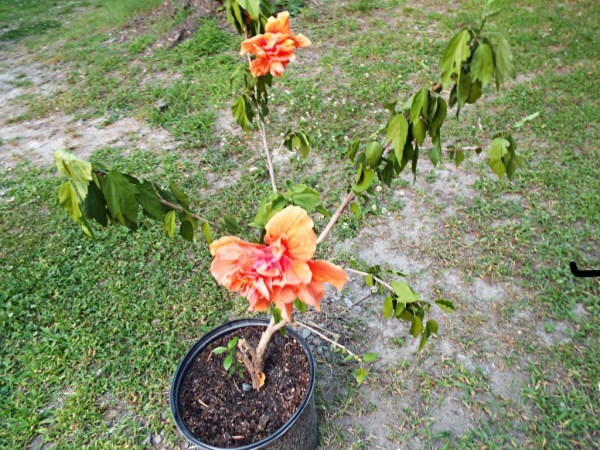 Tropical hibiscus needs a frost-free climate, while hardy hibiscus can grow in zones 5-11. If you have the patience, sow seeds indoors in late winter and transplant seedlings after your last frost date in the spring. For first year blooms, purchase plants from a nursery in the spring. Plants generally don't need dividing, but new plants can be started from cuttings taken in late summer and rooted indoors over winter. Space plants 3 feet apart with root crowns set 3 to 4 inches beneath the soil. 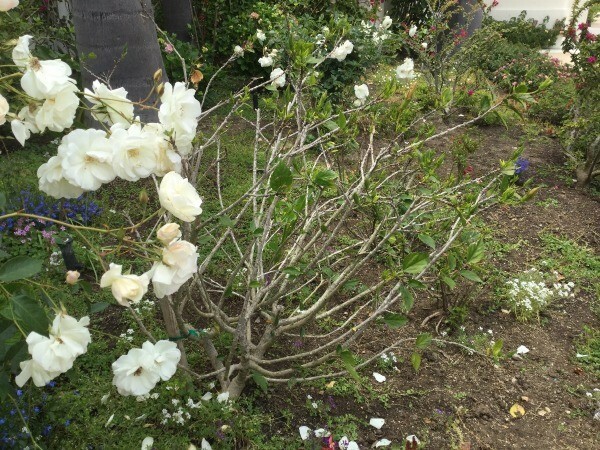 Regular pruning keeps plants shapely and invigorated. New growth starts below any cuts made, so plan accordingly when stepping back to assess the plants overall shape. A good rule of thumb is to cut 1/3 of the branches back by 1/3 over the course of several years. 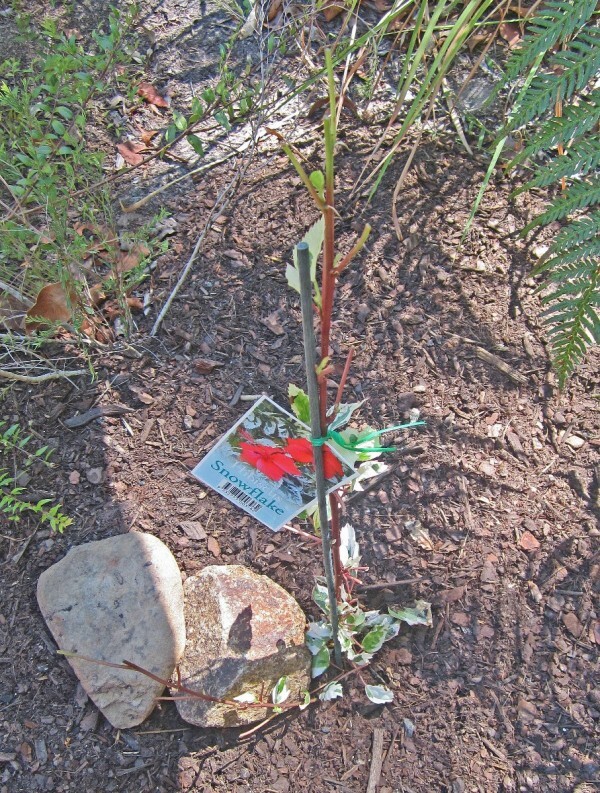 Always use a sharp sheers so bark does not get stripped from the stem. Always leave at least 2-3 nodes or "eyes" (bumps on the stems where leaves used to grow) on each branch and leave about 1/2 inch between the eye and the cut. Omniscience would have to be very boring. It would be pointless to have a conversation with a friend, knowing all the while exactly what you and they would say. Every sentence would be like déjà vu all over again. I'm glad we have mysteries. They give life intrigue and awe. A reason to ponder, a spark to set the imagination afire. A beauty unfelt by the all knowing, all seeing. My hibiscus rosa-sinensis is in the throes of death. Several limbs have died, one at a time. I don't know why. I kept pruning them off as they declined. The whole affair was a mystery to me. Today, I noticed how sad the entire plant looked. It is giving up the ghost. I will miss what has been a beautiful plant. It often continued to bloom while kept indoors over winter. The real mystery here is what drives this plant to make a last ditch effort to continue its own kind. In its final hours, with the rest of the plant almost gone, it produced one of the largest flowers of its lifetime. The Universe is teeming with stellar nurseries where baby stars are born of and nourished by, the remnants of their deceased parents, always continuing after their own kind. Even so, with the Earthly hibiscus, there is indeed life in death. Gardening is only as interesting as you are. I bought a hibiscus plant at a flea market; the vendor told me it was a perenniel for our area of the country. She said that the "old wood" should not be cut back at the end of the season, it should be mulched for the winter months; in the spring the mulch should be removed and feeding should begin. I have many hibiscus plans and several seem stressed. What can I do to help them? Tropical versions do not do well in colder weather. Is is too cold where you are? Hibiscus like acid soil so get peat moss or potting soil for it. 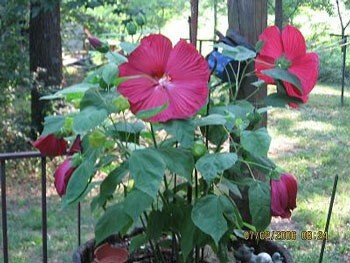 It looks like these are well established hibiscus plants so they must have been in the ground for several years. Your zone must be in the high numbers or these plants would not have survived the winter months. Hibiscus generally need to be pruned every year and really should not have other plants/weeds growing in their "space". 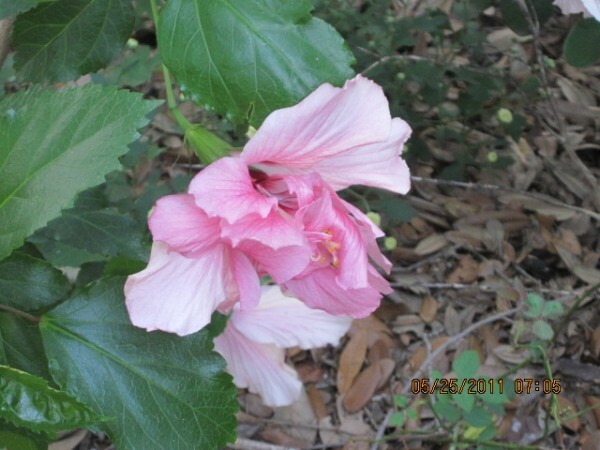 For a beginning, take a good look at your plants and try to determine what is really wrong - you can read about the problems with growing hibiscus and see if your plants match any of the conditions noted. This is the only way to help your plants. It really looks like your plants need a good pruning for a start and maybe try to clear some of the area around their root system. Here is an excellent site that has listed most of the problems - with solutions - that may help save your plants. Read everything and just keep hitting "next" at the bottom of the page as there are several pages of information. I have an potted hibiscus that is almost 5 feet tall and blooms continuously all winter. In the summer I put it outside in a partly sunny location and it remains healthy, but does not flower. Prune back 1/3 in late spring or early summer. Do I wait till it stops blooming then prune back? Last year I was having trouble with the leaves on my hibiscus cupping very badly. Also with a Black-eyed Susan, the leaves weren't cupped, but deformed and scarred. I came to the conclusion that they had powdery mildew; all symptoms seemed to point in that direction. This year they both came up looking perfectly fine and healthy. They were growing as they should. Then they started to look a little tattered as time passed. Of course I gave them a good shot of soapy water and fed them. I staked the hibiscus for support against the wind. They just slowly started looking worse. I think I was incorrect in my diagnosis of powdery mildew last year. We get a lot of wind here for several days in a row at times (20 to 30 mph gusts and 15 to 20 sustained). There is nothing on this side of the house for a wind break. I placed some bricks, with 3 holes in them, a little way in front of the flower beds that were the worst target for the wind. In just 1 week the Black-eyed Susan was showing a great deal of improvement. Now it is sporting several buds. The hibiscus plants however are more toward the back of the bed and are too tall for these small bricks to make a much of a deflection against the wind. The hibiscus looks just as they did last year, there is very pronounced cupping of the leaves (most especially the newer leaves). I am going to move them to a new location where maybe they'll be somewhat protected from the harsh winds. It is, however, in a partly shaded area. Can plants actually get mildew in an area where there is rarely any humidity or rain? We live in zone 5 in the very southeast corner of Colorado, the very southwest corner of Kansas, and just north of the Oklahoma panhandle. We are now in the process of planting as many lilac bushes as we can around the property for a windbreak. I planted an assortment of 9 shrubs last year for this very purpose. Not nearly enough to cover the area we need covered in the country. I don't have the time to wait for those 9 shrubs to grow into a windbreak. They were planted in well thought out places, with the intent to fill in the gaps by adding a few new shrubs every year. But it is what it is and I have 6 very mature lilac bushes that have oodles of shoots just begging to be dug up. I just transplanted 10 in a line on the problem side of the property and we're not halfway through digging holes yet! I hope that deflecting the wind improves the growing conditions on that side if the house. So many ideas, but nothing seems to grow well there. So, I guess the question is, what kind of wind can a hibiscus tolerate and what would the damage to the plant entail? I could be wrong again about the wind, too. The plants leaves are cupped and they just look altogether fatigued. I wasn't able to load a picture of my poor hibiscus plants when I sent my question .... I am going to try now & hope it works. I am having the same problem and I read that stress on the plant or too much nitrogen can be the cause. I did use a different type of fertilizer this year so who knows. Last year this did not happen and it is these plants second year. Last year was the first time I tried hardy hibiscus. I got roots from a mail order catalog and planted them in late spring with plenty of sun. We have very sandy soil so I water often, every 2 days, saturating the soil. The leaves on all 3 plants are cupped to such an extreme that the new leaves look like miniature lobster claws. The older leaves look like little boats. They haven't lost any leaves, they are still growing and there is no yellowing. The biggest plant hasn't bloomed at all. The second biggest plant had 2 blooms, the smallest had 3 buds; 2 small buds that dried up and fell off. The 3rd bud did bloom. Both flowers had beautiful color (white with a burgundy center), but they didn't open up the way they should. They weren't as big as the ones I've seen on plants not 4 hours from here. There were spaces between the petals. The petals were sort of long and slender. I also have Black-Eyed Susan at the end of this same bed with some leaves misshapen and having bronze like spots on tops and under sides of leaves, as well as a fringe of bronze around the edges. These flowers are small, but otherwise look normal. They aren't a year old yet, so maybe small blooms are normal? Has my bed got some sort of disease? Or are they starving for nutrients? I've fed them liquid iron 2X in the last month, added organic granules to the soil when they first came up in spring and drenched them with a 20-20-20 soluble food 1 or 2 times in the last 2 weeks, thinking it might help. I don't want to give them too much food for fear of causing more problems. These are the only plants effected in that bed, the sedum and Red-Hot Pokers are fine. Anyone? Never mind. Day after day I have searched the web for an answer, and asked everyone I talked to if they might know what is wrong with my poor pathetic flowers. No answers could I find. Then last night I figured it out! And all by my desperate self. Both the hibiscus and the Black-Eyed Susans have powdery mildew. It appears that the disfigured leaves and spots are the prelude to the white stuff; which has now made its grand entrance. It's really sad because, I was so excited and so proud of myself for figuring out the problem on my own, because ten minutes later both of my Black-Eyed Susans (blooms and all!) were sheared to ground! The Hibisbus will suffer the same here in a few hours. Then the treatment & recovery begin. I didn't get to read your article before you sheared your babies down, but both will return. The powdery mildew I keep at bay by making sure my hibiscus is in a lot of sun and in the rainy season, I use dawn dish soap and bleach (doesn't take a lot) in a quart sprayer about a tsp. of each). Do it in the evening after it gets cooler and let them grow. You still probably need to fertilize the hibiscus & black eyed Susans. Remember it is a wet land type plant. 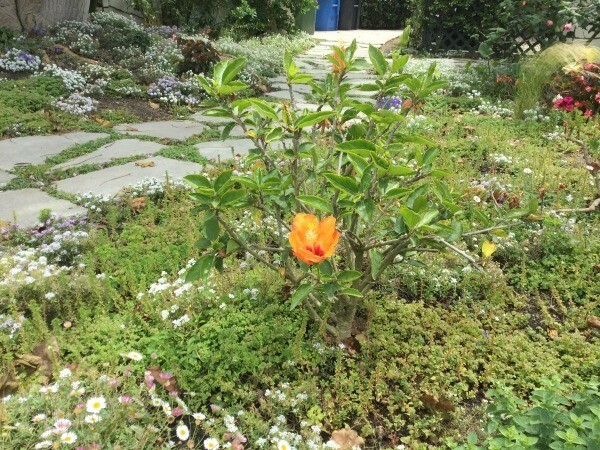 Just water well in dry times and fertilize. Keep growing. I have a hibiscus tree that I brought in this past summer and the leaves are curling in. What is going on? I have no idea. I do know that several insects use webbing to draw the leaves around their nest. 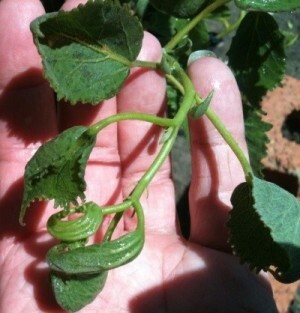 Do closely examine the curled leaves, both topside and bottom. Both of these plants hibiscus grew beautiful flowers, but now seem to have some disease both on leaves and stem. Their location was changed to another part of the house, then they were brought to the original location, which has more sunlight and where they bloomed many a time, this happened. Is there a way to treat them? It's a little difficult to tell froom that picture but it looks like it may be whitefly, not uncommon for Hibiscus to get. Don't worry. 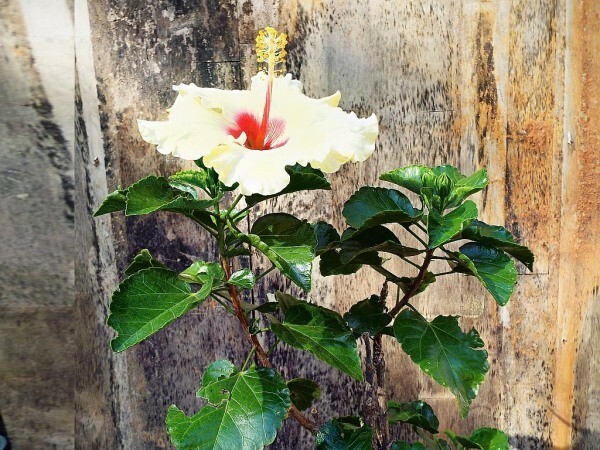 While your Hibiscus MAY be angry and upset at this, you can save her. But you must act fast. First, start by taking Palmolive soap (MUST BE PALMOLIVE) and get one of those 1 liter spray bottles. Put in about half a tablespoon of the soap in the bottle and then fill it with water. Fill it slowly so as not to get massive foam forming iin the bottle. Make sore to shake it well so that the soap dilutes in the water. 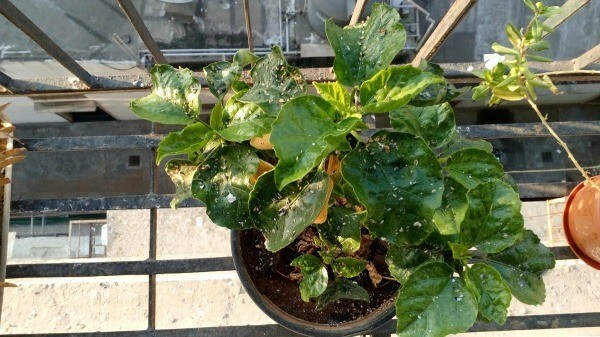 Now Spray your plant like crazy with this mixture EVERY DAY, preferably NOT when it is exposed to sun as water beads magnify sun and will burn the leaves, rendering your plant MORE unhappy. The oils in the soap are good for the leaves and your plant will ove you for it. The soap of course will dry out the eggs (most likely the white dots) and burn them as much as possible. When you can, try to wipe the leaves down CAREFULLY, and don't tear the leaves as you do so. For how long do you spray? Well that depends on your hibiscus and how fast it helps. I would say a better part of 3 months, at least 2 EVEN if the leaves appear clean after. Also SPRAY the earth with this mix. I also recommend you water her first BEFORE spraying the earth, simply because you don't want to wash away the soapy coating that lays on the earth. For the first 3 weeks, spray her every day. After that a rate of 3 days YES and 1 day no. Soap is a little tiring for the plant too after a while and she does prefer water than soap. The oils in Palmolive will keep the leaves from drying out. As for rubbing down the leaves, DON'T START right away! Try this after a week or so when the soap has had time to have an effect. And again, don't be afraid to over spray. Oh and, make sure to spray both on top and UNDER the leaves! White flies don't discriminate where they rest. Question: What Ate My Hibiscus Leaves? I just planted a variegated hibiscus and overnight something shredded/ate virtually every leaf. I live in Queensland, Australia. Could the culprit be a brush turkey? It looks like some kind of a bug. Use insecticidal soap. I had lots of aphids on my hibiscus. I sprayed soapy water on it after the sun went down, but since I live in Florida, the next day there was plenty of sun. Within a few days all the leaves and buds fell off. Did I kill it or will my hibiscus come back? At least 50 years ago a brother in law told me that I could determine whether a plant was still alive by scratching it on the main "trunk". If it's still green the plant is still alive. I'm sure your hibiscus is still alive. I certainly hope so! I love those things! Last spring, I bought a hibiscus at a reduced price. It really looked bad. Its stems had the most unusual appearance. Well, for 2 dollars, why not? I brought the little fella home and started a routine of TLC. Upon closer examination, I found the plant was more dead than alive. Half of those strange looking stems were mushy. I cut all those out. The poor thing looked pitiful. Next, I realized I was not actually seeing the stems. They were completely obscured by a thick layer of some type of brown scale insect. That accounted for what I thought was strange looking stems. Malathion to the rescue. All year long I babied that plant. At intervals, I sprayed it with more Malathion. I fed it Miracle Gro regularly. I gave it a sunny spot and never let it get dry. It wasn't in bloom when I bought it, and after a whole season it still had not bloomed and looked near death. I brought it in for the winter, where it stayed in a state of 'giving up the ghost' the whole time. It lost all its leaves. I couldn't give it the strong sunlight it so desperately needed. Come spring, I took it back outside and started the TLC all over again. Now, after another year of intensive care and with cold weather just around the corner, this little fella finally musters up the strength and will to show me its appreciation. It blooms! And a lovely bloom it is, unlike any I already have. Too much time and care spent on a 2 dollar plant? Not a chance. Would I do it all over, again? My answer is in the picture. 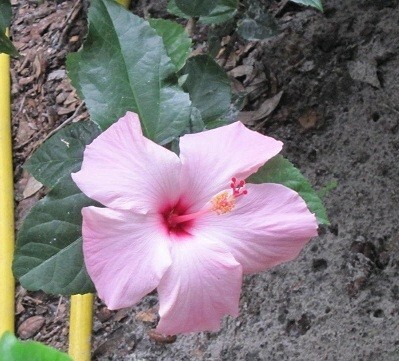 In the pictures below, you will see 2 kinds of Hibiscus; the summer hibiscus, which can be planted with mulch farther north of zone 8, and the regular tropical hibiscus which can be grown as far north as the ground doesn't freeze. Note here that a killing frost will kill back to the ground the regular hibiscus also but it won't return as quickly as the summer hibiscus. In areas with no frost, the regular hibiscus will bloom year round and so will the summer hibiscus but they are 2 different kinds of plants. 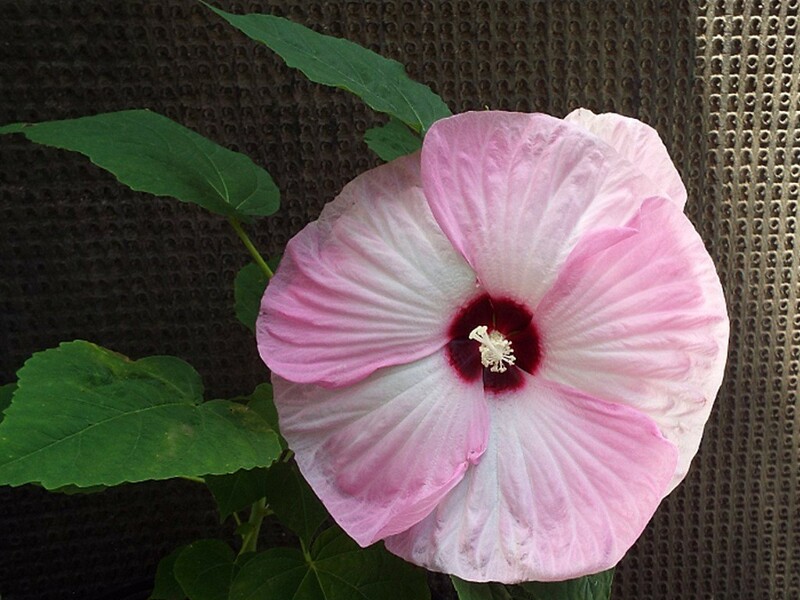 Summer hibiscus used to be named plate size hibiscus in local circles as the blooms get plate size and are singles. Regular hibiscus in zone 8b the top height of regular hibiscus is usually 4 to 6 feet depending on water and fertilizer and sunlight. Both are beautiful but above the zone 8b, you will have to keep your regular hibiscus in a pot and take it in in the winter and out in the summer (the more sun the better) and don't forget ferterlizer and water. Before the first frost, you make sure your plant is bug free and bring it into the warmth with a sunny window. It will slow up but will still keep blooming if your light is right. Inside remember not to over water, it takes less. There are numerous colors of both summer and regular hibiscus and all are beautiful. You don't find very many doubles and triples above zone 10 but they will grow just a great indoors as stated above. Most plant books aren't the place to look for the different colors of hibiscus but you can google "hibiscus plants" (or contact me and I will give you a few that I know are good). 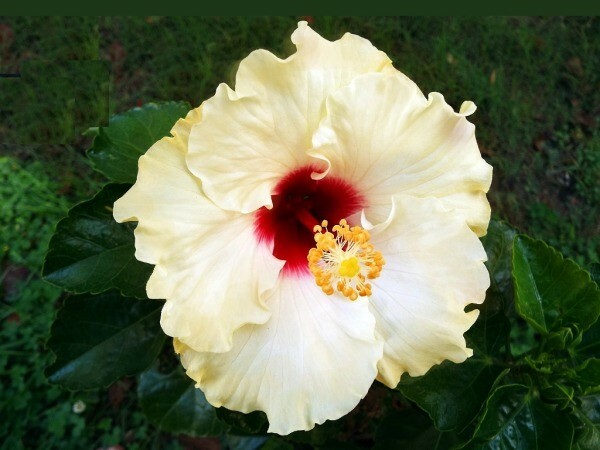 The summer hibiscus will grow from seed in one season to blooming size but the regular has to be rooted cutting and still will give you bloom the first season on even a 1 foot high plant. Happy growing. 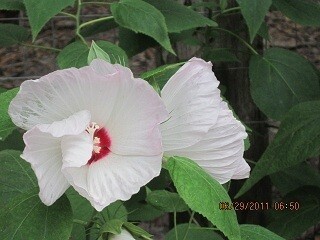 The white with pale pink edge is a summer hibiscus and the other 2 are regular hibiscus plants. I found these this morning in a neglected corner of my back yard, an area I seldom visit. 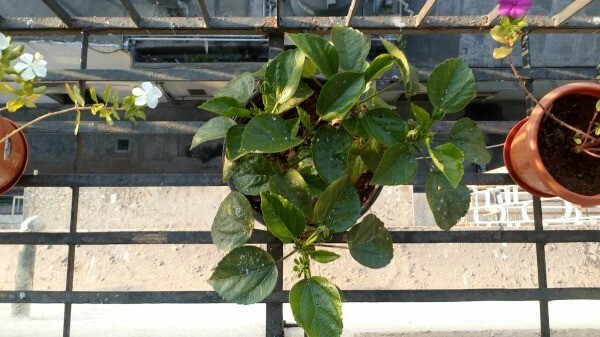 This plant has been in a pot for several years. I think by rendering such a beautiful display, it is trying to tell me it is worthy of its own little parcel of terra firma. 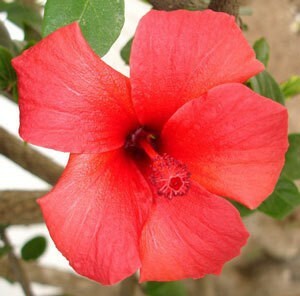 The hibiscus is a large genus of flowering plants that are native to temperate, subtropical, and tropical climates. Winter protection allows you to enjoy them in colder area gardens. 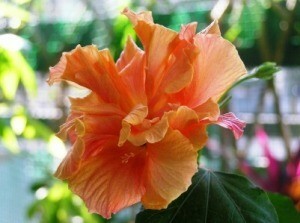 This is a guide about hibiscus flower photos.